also recorded by WOODY GUTHRIE in the 1940s (with Cisco Houston and Sonny Terry), which is most likely Dylan's source. (unreleased Basement Tapes, Woodstock, West Saugerties, NY, Spring-Fall 1967). (rehearsals with Grateful Dead, San Rafael, CA, 1987). (studio 1970 and 1975 (or hotel room? ), various live performances during the "Never-Ending Tour", 1992-'93). (Gothenburg, S, Jun 28, 1992; probably learned from TOM PALEY's version). tune used for "Paths of Victory." (CD RE-RELEASE BY BEAR FAMILY RECORDS, BCD 15434, 1989). "the musicians were all from left field that I hadn't worked with before, but they were excellent." Otto Kitsinger, liner notes for Bear Family Records BCD 15434, 1989. 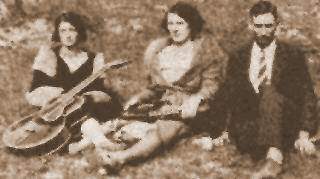 Members of the 1960s Carter Family (Maybelle and her daughters June, Anita and Helen) also provide backing-vocals on Johnny Cash's covers of Dylan songs.